This type has a shape like a cone or column cut at a slant, which allows users to select the cut surface size depending on the workpiece. It is used for drag soldering and pre-tinning of lead wires. 6.Professional production in internal and external heat lead-free soldering tip, such as 30 W,40W,60W,80W,100W,150W,200series,900 series. 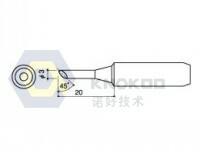 Meanwhile, we can custom-made the special shape soldering tips for you.